I finally landed in New York which explains why I wasn’t able to blog the past couple of days. To those who are not aware, the flight from Manila to New York takes about 15-16 hours. Suffice to day, my bum isn’t all that happy right now haha! Too much sharing? Yeah? Okay, I’ll stop. LOL! The coming days will be even more of a challenge. I don’t know how I’ll be able to squeeze a few blog entries in but I will try my best! Not being able to blog is making me feel like a druggie enrolled in rehab. Cue dramatic music. Anyway, I’m still a bit jet-lagged so I’ll make this quick! Here’s another outfit post taken a few weeks back. Scarf prints have been everywhere these past few months! It’s a trend I warmly welcomed with open arms. I remember how I used to play with my mom’s old scarves and scarf-print clothes back when I was little. There’s just something about that time. People then looked so much more regal, or maybe it just seemed that way to me because I was still a kid looking at the oldies with so much awe and delight. Whatever the reason is, scarf prints always remind me of the good old days. I guess this is the reason why I associate them with vintage things and that certain old school regal charm. Haaay! ma’am Camille malapit na po akung mabaliw sa inggit! kasi po ang ganda ganda nyo po tapos ang ganda ganda rin ang mga sinusuot nyo! Love the shoes!!! I gotta have them! I just looked them up on the Mango website but couldn’t find them. Do you remember the name? did they come up this year?? Thanks!! Love it. I thought it was a dress! By the way Cams what do you wear underneat when wearing dresses?! Spanx?! Oh no, usually just my underwear haha! Thanks Rachel! ikaw na talaga ang the best EMOtera of the year! how can you pull off such an outfit? iba ka. Haha thanks Precious! :) I don’t know! 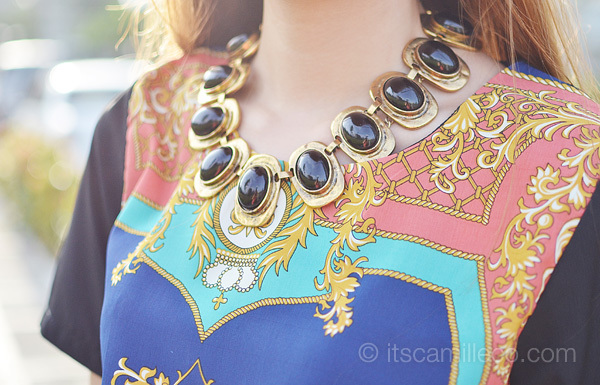 what a chic printed dress! I love the print. :)) it rocks. haha. :D and I love your wedges, too. looks so comfortable to wear. my most favorite filipina fashionista ever. never fail to surprise me with your fashion. very versatile indeed. i love it!! Thanks Ish! I think so too! great outfit as always! love the shoes, wanna have those pairs! Love these prints! Definitely using this for inspiration for myself! Right! There you go Claudine! Thanks Irene! you look great but i really hate this trend LOL you make everything look better!! Awww why!!! I’m glad I look forgivable haha! I absolutely love your style. I need to make a trip back to the Philippines to shop at your store and bring it back here to Cali. Check out my channel when you get a chance. Here’s my question: How many stop overs did you have? My Manila to Virginia was not fun at all. Running between gates with only minutes to spares. Looking forward to picture spam! And what is it about your shoes that make me think that they can kill people? I hope you got through airport security just fine, =D This get up of yours seems to be the least accessorized of yours. Also, a little bit of photography nit picking, the sun at your back kind of desaturated the colours on your dress a bit. Don’t know if it’s your style but there may be a bit too much flare, particularly pic #5. Are you using CPL filters or may be hood on your lens? And yes to picture spam! Ah.. Light/dreamy effect, yeah I guess it worked. Not a complete fail. Just that some of the detail got desaturated or eaten by the flare. Perhaps if it were underexposed by 1/3 more, you’d get a more ideal mixture of contrast and desaturation. just my thoughts. haha Sorry, couldn’t help being a pixel peeper XD. And an hour long stopover in HK is not bad at all, though I would have preferred staying an entire day there. I will! Haha thanks Yen! Everything looks soooo put-together….perfectly polished!! i just love how you can effortlessly mix and much prints! this looks amazing! Just for a short vacation :) aka shopping! Must be the print? Or the gold? :) Thanks Lloyd! OMG I AM SO EXCITED FOR YOU! HAVE FUN IN NEW YORK! WATCH A LOT OF BROADWAY SHOWS! TAKE OUTFIT PHOTOS IN TIMES SQUARE! TAKE OUTFIT PHOTOS IN HIGHLINE PARK! TAKE OUTFITS PHOTOS ON THE EMPIRE STATE! TAKE OUTFIT PHOTOS EVERYWHERE BECAUSE NEW YORK IS BEAUTIFUL AND ARTSY AND DIVINE! Okay, I’m done fangirling. Hihi. Have fun!!! Hahahhaa I will try my best! SO INLOVE WITH THE SHOES. lovely. The prints are so lovely! I love scarf prints too, it makes the simplest outfit looks like they worth a million bucks! Oh wow, you’re such a Goddess, Camille! 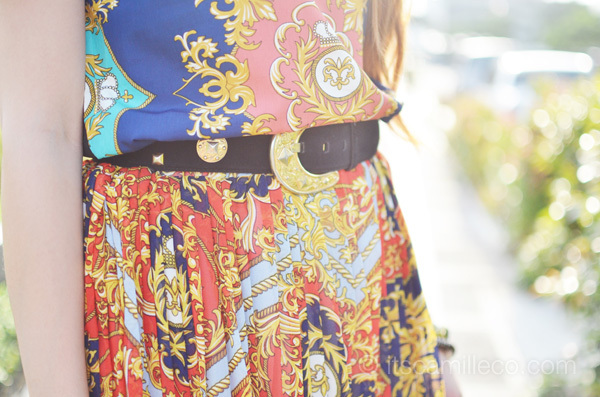 I love how you mixed the prints of your top and skirt. At first, I though it was a dress. Haha :) Anyways, it’s been such a long time since my last visit to your blog. Lol kidding not too long actually cause I can’t do that. Haha I missed a lot of your blog posts, cause of too much schoolwork. :( But ohwell, I’m here now browsing everything I had missed on your blog. Hihi ;) Yay! Btw have fun there in NY! And take care! Thanks Marga! :) Of course that’s understandable! School comes first :) Have fun in school! Ay matingnan nga! Haha thanks Nica! She’s great! :) I wish I can raid her closet! Why were you not able to attend the Yahoo OMG awards? New York, my favorite place. Kindly take a photo of the empire state? pretty please. :) Thank you Ms. Camille. Thanks Erlyn! I’ll try! We’re not doing a lot of touristy stuff haha just shopping. :) But if we pass it, I’ll take photos of it for sure! ohhhh thought it was a dress! Cause they’re meant to beeee! :) The prints are so cool! YES!!! Why do these places have to be so far!